Dr. Marley Smith and Dr. Heather Smith opened Livin’ Well Family Chiropractic in 2012 to show others the difference in livin’ and livin’ well. 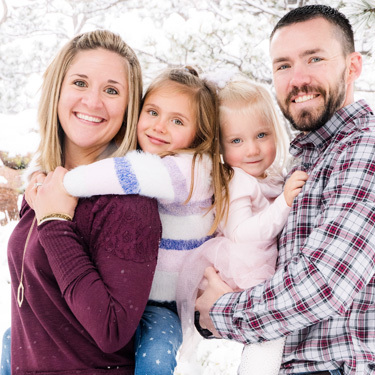 Since the very beginning, our main priority has been taking care of families of all ages, and we continue to provide leading chiropractic care to Cheyenne and surrounding communities today. Our team works to educate, empower, and adjust as many families as possible on their journeys towards health and true wellness through specific chiropractic care. Dr. Marley and Dr. Heather’s specific adjustment system, prenatal chiropractic service, and specialty in chiropractic for children allow them to successfully serve countless people with differing needs each day. With the help of the Gonstead technique, the Webster technique, and our ongoing educational workshops, families have the opportunity to learn and play a vital role in their very own health and wellness. Seeing the lives of families transform as they embark on the chiropractic lifestyle is our dream. Although we extend care to most people, the vast majority of our practice community consists of families. Parents, grandparents, and children all have a place at Livin’ Well Family Chiropractic. Our family-oriented practice was built to provide ease to mothers and fathers and comfort to their children while receiving compassionate chiropractic care. Throughout the years, our practice has seen it all. From subsided migraines, increased mobility, and healthier immune systems to cancelled ear tube surgeries, life without long-used medications, and improved fertility – we have observed the wonders of chiropractic care firsthand. It is our purpose to optimize your health in a natural fashion, and that is what we will do. Get started with us by contacting our practice to book your first visit today.